The football triumphs and off-the-field tragedies of Chargers great Junior Seau form the basis of this documentary, debuting on the network's new ESPN+ service. Watching a documentary about Junior Seau was never going to be an objective experience for me. On long car rides to visit my grandparents in Oceanside, CA, I would bring along years of Chargers media guides, replete with decades of records, statistics, and game results I would try committing to memory as if they were holy texts. In the mid-’90s, the same defensive megastar would grace those covers year after year. It’s the same man, captured in his signature celebration pose, whose No. 55 jersey I would wear one Halloween as a scrawny grade-schooler posing as an NFL great. Wearing that plastic helmet would be the closest I’d come to playing football myself, but to this day, at the bottom of a dresser drawer, I still have a 1995 AFC Championship shirt. Guess who’s the only player on it. “Seau,” the latest film under the ESPN “30 for 30” doc umbrella is a worthy addition to a well-established template of sports stories designed to delight and challenge die-hards and oblivious observers in equal measure. Because at its core, this film makes a strong case that San Diego Chargers linebacker Junior Seau, for a time, embodied the best that football had to offer. A gregarious on-field performer with enough energy to befit the lightning bolts that ran up and down his jersey, all it takes is a quick collection of defensive plays to show how one man’s will could overpower all 21 other players on the field. And then, there’s the other side of that rise; a precipitous drop that ended with his tragic suicide in 2012. Seau shot himself in the chest in an attempt to preserve his brain for future examination. The day of Seau’s death is where the film starts, affording the audience — now also equipped with years of intervening head trauma studies — an idea of where much of this story concludes. So that even with a bevy of testimonials to Seau’s bubbly character and exuberant parenting style, there’s always an idea that the full picture is yet to come. The moments in “Seau” that peek through that clouding sense of obligation are the ones that do in so many of these other “30 for 30” projects: the archival footage that travels one layer beyond the usual sports media ecosystem. It’s startling enough to see the NFL Draft confined to a hotel ballroom with a smattering of enthusiastic applause in the background. 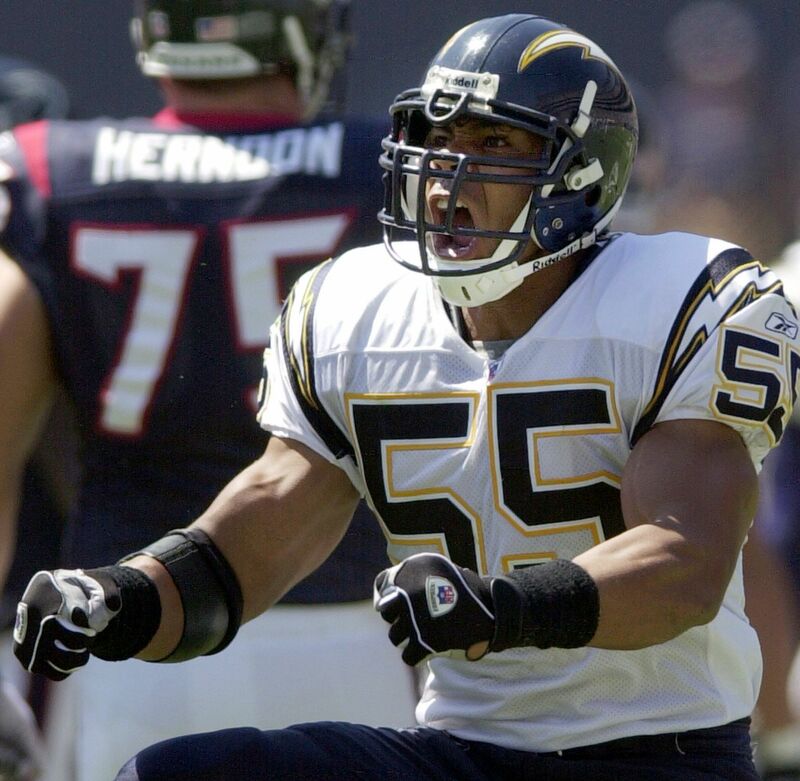 But seeing Seau’s exuberance at being drafted fifth overall not only shows how much rookie attitudes have changed in the decades since, that lack of a need for an immediate backstage interview offers a spontaneous window into Seau’s professional life that football players rarely get a chance to show. Early on, “Seau” is swallowed up by the charisma of the man himself. 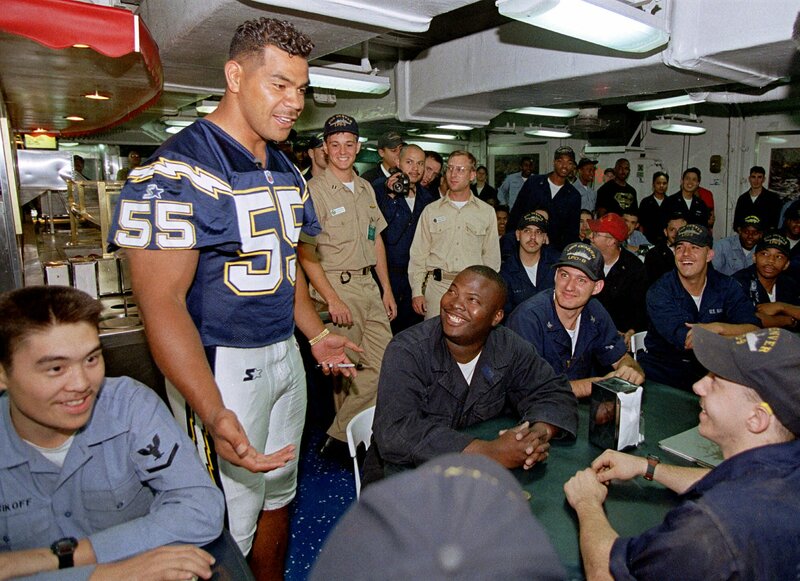 From high school sports highlight reels to footage of Seau beaming ear to ear while going through a hearty line of autograph-seekers, it’s easy to see how he became a city-wide icon. Director Kirby Bradley doesn’t frame the film as an explicit downward slide, but his choice of candid interview moments cue the audience to the idea of something starting to go wrong before any of the film’s subjects put words to it. When those subtle changes start to become more pronounced, the conversations turn from outlining the arc of Seau’s career to concern about the changes in his demeanor away from the game. This view of football looks backward in time, but still investigates similar ideas as the recent Starz series “Warriors of Liberty City” tackles while looking forward. There’s an incredible burden, both physical and psychological, when the financial prospects of an entire family rest on the abilities of a child, as was the case for Seau, growing up in 1970s Oceanside, CA. One recurring theme of “Seau” is showing how that sense of purpose (and in his own words, a kind of duty) eventually curdled when he no longer had a career. The aftermath of his suicide gives the documentary a chance to take a wider-scale look at the NFL’s response to concussion-related developments and research over the past decade. Given ESPN’s past history with documentaries about CTE and brain injuries, it’s surprising to see something condemnatory of the league’s inaction, however glancingly. Still, that this is ultimately Seau’s story and features the participation of former teammates who happen to be current players (Drew Brees) and current ESPN personalities (Marcellus Wiley) adds a dynamic almost as effective than something more accusatory of the league’s fatally sluggish response to head injuries. Instead, there’s a silent, unspoken critique of a league that through its inability to address the issue, made it acceptable for players, announcers, and fans to shrug off serious hits as a guy just “getting his bell rung.” Withholding the full extent of the pain and toll that a vicious style of play can have on those who attack with a certain amount of abandon, the film mirrors that same sense of dangerous buildup that those around him gradually came to recognize as his life continued. In striving to present a full portrait of Seau’s life, “Seau” eagerly presents the flattering media-image version of the entrepreneur, philanthropist, and citywide ambassador that he became. Bradley also faces the unenviable task of having to situate Seau’s late-life behavior within the context of the disease he was fighting. The film is very careful not to explain away violent and erratic behavior, including multiple incidences of alleged domestic violence, as purely a product of concussions. It presents him as a product of his environment within a difficult family life, looking for validation from outside sources in ways both related and unrelated to his rapid ascension to fame. But there is still that clear contrast drawn between the competitive joy and the empty listlessness that came to define the changing periods of his life. It’s a dichotomy many football fans find themselves having difficulty reconciling, unless they’ve either already moved away from the sport or choose to ignore the problems entirely. Either way, here’s this singular talent embodying both sides of that divide. For those who can still segment those concerns away from their fandom, “Seau” offers a compelling overview of his career, illustrating the lengths players are willing to subject themselves in order to reach a championship apex. (It’s easy to forget that the throw that led to the Super Bowl XLII Helmet Catch sailed right over his head.) The film doesn’t make the same mistake in being all consumed by on-field performance that it posits the man himself sometimes did, but it also doesn’t shy away from how much he succeeded in that area. Statheads can revel in his output. Old-school stalwarts can marvel at his tenacity. That’s why the balance of having the San Diego community to return to feels so vital to the film’s success. The drone shots may be a familiar shortcut to establish time and place, but there’s something about seeing that aerial footage transition from water to shore to neighborhood that evokes that feeling of being close to the water. When his family speaks of the serenity he felt on the surf, away from the pressures of a life he had increasing trouble understanding, it’s hard not to see why. There’s a shortcut to seeing him framed against the Oceanside pier that mirrors an opening montage of dozens of Seau confidants offering their own version of his trademark “Buddy!” greeting. So “Seau” wrestles with that imbalance, with how hard it is to hold two disparate ideas of someone in your head at the same time. With another NFL season in its early stages, this is the kind of full view of the business that’s illuminating and sobering in equal measure, a celebration of what sports can be and what they can do. I’m glad that, in the past, I had that starry-eyed view of a football giant to hold on to. Now, with time, there’s another one that’s slid in its place. Both are real in their own ways, but “Seau” seems closer to the truth. It’s hard for anyone who’s had that lingering passion to consider, but as a nationwide fanbase reckons with what this game does to the men sacrificing to keep it afloat, it’s a valuable reminder of the many who have lost far more than just memories. “Seau” is now available to stream on ESPN+.